For the Indian Hero MotoSports Team Rally, both the riders delivered solid performances to close the Marathon stage in a strong position for the team. Oriol Mena has been consistently delivering under top 20 performances for the past few stages and today was no different as finished SS08 at 12th position. This performance helped Mena in defending his top 20 ranking and grabbing up the 18th spot overall. "This was a good day for me," reported Oriol Mena. "My body was feeling good and I started the stage really well. For this stage I decided to ride with my full potential and finish the stage without any major mistakes. I did lose maybe 20 seconds in one small navigation error but it was ok as I reached the finish line and my bivouac in good time. So one day more gone and now one day less to Cordoba." CS Santosh too has been gaining good ground lately and continued his steady run today as well. He finished the tough marathon stage at 38th position, which lands him at 42nd place in the overall rankings at the ends of stage 8. "I think this Marathon stage was the hardest I have ever done," Santosh said. "It was incredibly difficult as we did 80 km off-piste and the camel grass. I was physically drained with the high altitude riding and also crashed a couple of times. By the time I reached the marathon bivouac I had nothing left in me. 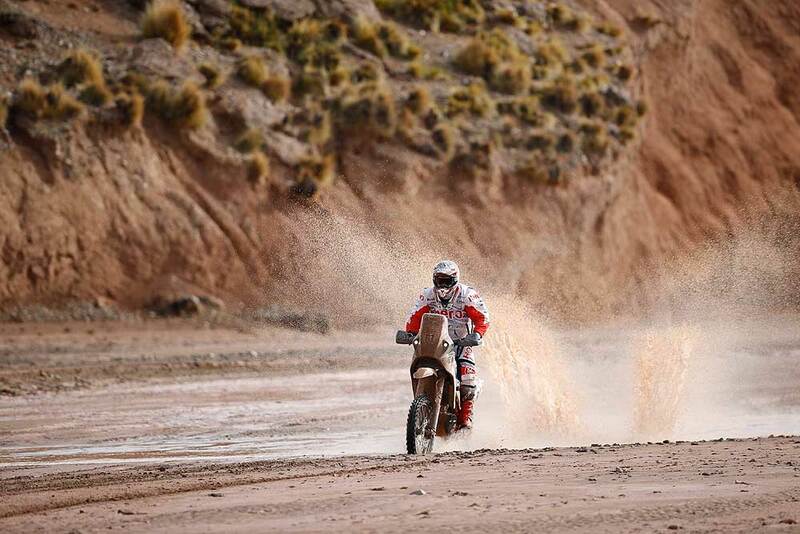 This morning we had the longest stage of the Dakar which was tough again. Happy to be back here with the team, I missed these guys."